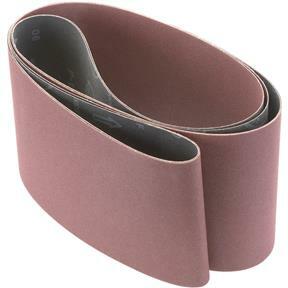 6" x 80" A/O Sanding Belt 120 Grit, 2 pk. Woodstock - 6" x 80" A/O Sanding Belt 120 Grit, 2 pk. These tough Aluminum Oxide 120 grit 6" x 80" sanding belts are sized right for all of your belt sanding needs and are sold in a 2 pack. I make wooden toys for the missions by the thousands. This 120 grit belt for my BIG sander if perfect. Fast, and still smooth enough.